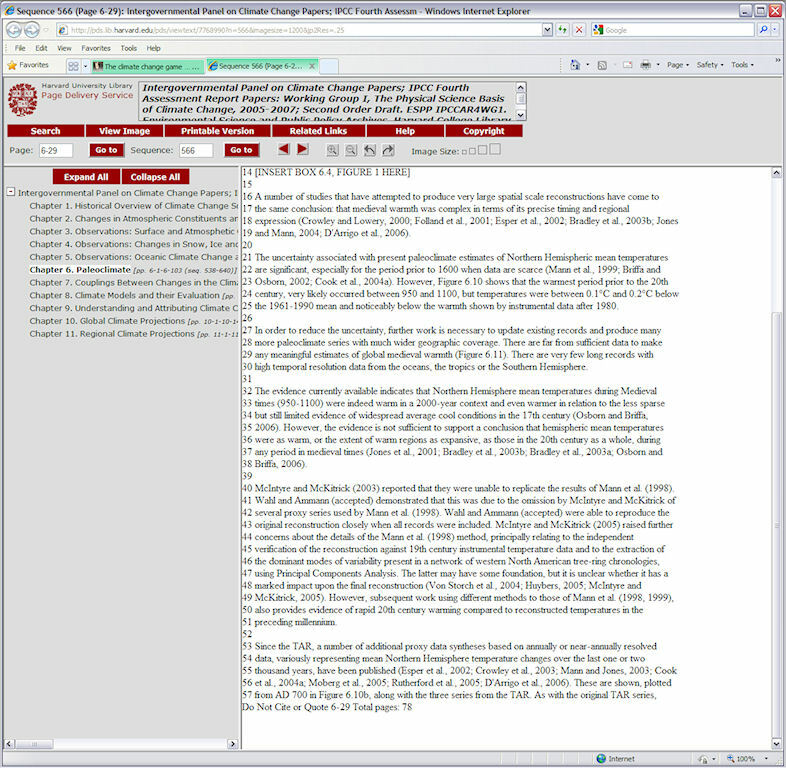 If you don’t have your reading glasses on, the text at the bottom is: “Peer reviewed and internationally available technical and socio-economic literature, manuscripts made available for IPCC review and selected non-peer reviewed literature produced by other relevant institutions including industry”. Hmmmm …. this diagram almost has a Monopoly board “look and feel” to it, don’t you think? The main activity of the IPCC is to provide at regular intervals Assessment Reports of the state of knowledge on climate change. The latest one is “Climate Change 2007”, the IPCC Fourth Assessment Report. The IPCC produces also (sic) Special Reports; Methodology Reports; Technical Papers; and Supporting Material, often in response to requests from the Conference of the Parties to the UNFCCC, or from other environmental Conventions. The purpose of these reviews is to ensure that the Reports present a comprehensive, objective, and balanced view of the areas they cover. BUT, there is something interesting that I didnt notice before. It points to, is consistent with, Briffa destroying mails. Now, how does briffa destroy a mail and STILL have it preserved in the record. hehe. easy. Mosher (who, btw, has now co-authored and published a book on Climategate) was referring to an earlier discovery of another of the CRU crew’s misdeeds in which Phil Jones had initiated a request that individuals delete their emails in which Assessment Report 4 was discussed. So I decided to “putter” around. My first stop was the incriminating E-mail. It would appear that CRUdite Keith Briffa had deleted an E-mail he’d sent to Eugene Wahl (another noble “climate scientist”), but had neglected to delete Wahl’s reply. I am taking the liberty (confidentially) to send you a copy of the reviewers comments (please keep these to yourself) of the last IPCC draft chapter. […] I am also attaching a review article Caspar and I plan to submit to Climatic Change in the next few days. [The idea is that this would accompany the Wahl-Ammann article, to summarize and amplify on it — given all the proper and non-proper interpretation WA has received and the need for subsequent analysis that WA only lightly touches on. Steve Schneider is aware that it is coming.] I think a read through this, especially the part on PCs and Bristlecones, can say about all I might offer additionally. It is not lengthy. MBH, for any newcomers to the “climate wars”, is the scientists’ acronym for the notoriously iconic “hockey stick” team papers. 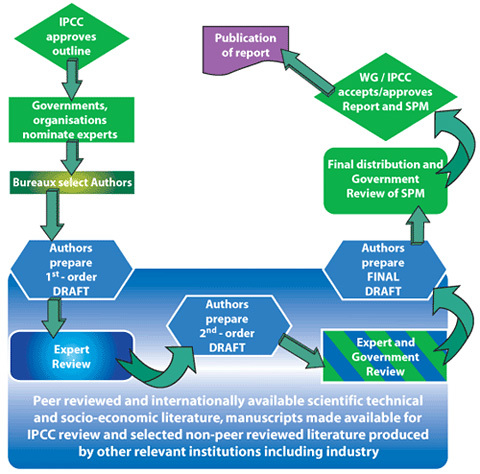 But, there you have it, folks, the much vaunted IPCC “peer-review” process in action. Briffa, btw, was a “Lead Author” on Chapter 6; and among the “scientific” papers discussed were not only his own, but those of Wahl (and his buddy Caspar Amman). As far as I can tell, these “Lead Authors” get the final word on what appears in the Assessment Reports (and perhaps the “Synthesis” report, and/or the “Summary for Policymakers” …. which – apart from very carefully crafted Press Releases – is probably the most many will ever read. But they know that. In fact, they seem to count on it. It might even be one of the IPCC’s unwritten “principles”. IOW, once the Reviewer Comments have been compiled at IPCC HQ, courtesy of the “Technical Support Unit” (TSU), the work of deciding the worthiness the Comments is divied up amongst the lead authors (who are instructed not to include their names in their judicious application of “Accepted”, “Rejected”, “Noted” etc. because “responses to the comments should represent the entire chapter team”). In case you’re wondering how I know this, I found it in the Climategate files, in a document called AR4SOR_BatchAB_Ch06-KRB-1stAug.doc. This 1stAug. date strongly suggests that Briffa completed this document after receiving Wahl’s July 21 helpful input. From where I’m sitting, I’d say that the “chapter team” succeeded in missing the point by a country mile. Surely they deserve to draw a “Go directly to jail … and do not collect $200” card. Conflict of interest must be an entirely foreign concept to these “climate scientists”. McIntyre and McKitrick (2003) reported that they were unable to replicate the results of Mann et al. (1998). Wahl and Ammann (accepted) demonstrated that this was due to the omission by McIntyre and McKitrick of several proxy series used by Mann et al. (1998). Wahl and Ammann (accepted) were able to reproduce the original reconstruction closely when all records were included. McIntyre and McKitrick (2005) raised further concerns about the details of the Mann et al. (1998) method, principally relating to the independent verification of the reconstruction against 19th century instrumental temperature data and to the extraction of the dominant modes of variability present in a network of western North American tree-ring chronologies, using Principal Components Analysis. The latter may have some foundation, but it is unclear whether it has a marked impact upon the final reconstruction (Von Storch et al., 2004; Huybers, 2005; McIntyre and McKitrick, 2005). However, subsequent work using different methods to those of Mann et al. (1998, 1999), also provides evidence of rapid 20th century warming compared to reconstructed temperatures in the preceding millennium. 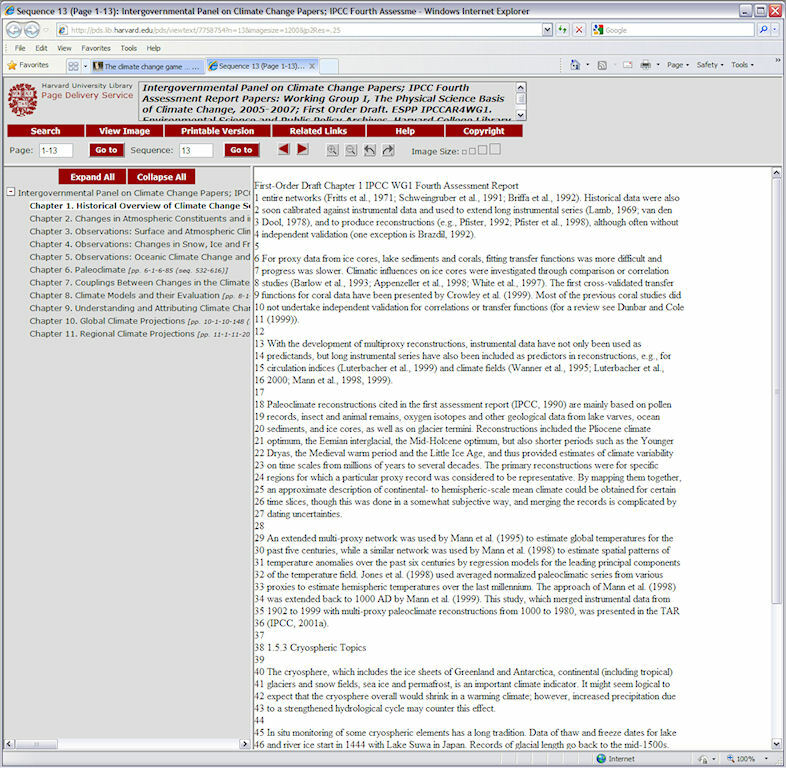 This was the Second Order Draft, which – according to the climate change game rules – required that it be submitted for “Expert and Government Review”. For the record, the total number of reviewers of this particular draft was 75, of which 10 were unidentified representatives of 10 different governments. We cannot know how many of the 75 actually read the paragaph. But we do know that it was read by at least 8 of them. With the exception of Eva Calvo’s suggested (and Accepted) cosmetic change Comment and the three comments from Michael Mann and Gavin Schmidt (a NASA gatekeeper who always makes sure that the dice land on a pro-AGW Alarmist property), all the comments took substantive issue with the content. Rejected – the current text represents a factual report of the substantive content of the McIntyre and McKitrick (2003) paper. The reviewers opinion is noted and in part accepted – the text in this paragraph is intended to convey a brief and basic assessment of the current balance of evidence regarding the features and likely reliability of the original ‘hockey stick’. It is not intended to provide a detailed elucidation of the criticisms or responses, but rather to provide an indication that aspects of the Mann et al (1999) methodology have been challenged and these challenges addressed. This list of references has been extended to include McIntyre and McKitrick 2005b and other minor wording changes made in response to other comments. The reader is also referred to the responses to comments 6-732, 6-734, 6-736, 6-1154 and to the comment 6-740 made by another reviewer. Your mileage may certainly vary, but it appears to me that the best that can be said about this “Final” version is that, yes, the “chapter team” did delete the word “omission” (as Briffa had indicated) only to replace it with several additional words that, in effect said the same thing. The observant reader will also note that what had appeared in the draft as “Wahl and Amman (accepted)” is now cited as “Wahl and Amman (2007)”. No too much evidence of any concern amongst the IPCC Monopoly players for their own rules, is there? One might be inclined to conclude that they make them up as they go along – and count on the fact that few if any will ever bother to verify anything for themselves. Some might read the “Synthesis Report” that forms the basis of the “Summary for Policymakers” but my guess is that most will not read anything beyond the carefully crafted News Release (or a reporter’s interpretation of the News Release). There are some differences between the online Final version and the pdf Final version that jumped out at me. While the text in the two paragraphs I noted above appears to be the same, they are no longer contiguous. They appear to have been “smoothed” by the insertion of a box containing several graphics – more than one of which bear a remarkable likeness to a … wait for it … hockey stick. And speaking of hockey sticks, you’ll never believe this, but I found one that had actually “disappeared” in some text. The Mann debate is primarily post-TAR and we leave to Chapter 6. An extended multi-proxy network was used by Mann et al. (1995) to estimate global temperatures for the past five centuries, while a similar network was used by Mann et al. (1998) to estimate spatial patterns of temperature anomalies over the past six centuries by regression models for the leading principal components of the temperature field. Jones et al. (1998) used averaged normalized paleoclimatic series from various proxies to estimate hemispheric temperatures over the last millennium. The approach of Mann et al. (1998) was extended back to 1000 AD by Mann et al. (1999). This study, which merged instrumental data from 1902 to 1999 with multi-proxy paleoclimate reconstructions from 1000 to 1980, was presented in the TAR 36 (IPCC, 2001a). Look, ma! No hockey stick – and no mention of McIntyre and McKitrick, either. Were Gerhard and others commenting on a different First Order Draft? Or did someone edit this draft after comments had been received and compiled? Those who deny climate change science are irritating, but unimportant. The argument is not about if we should deal with climate change, but how we should deal with climate change. Yep, sounds like the rules of the climate change game to me. I wonder if they picked this up from watching the IPCC in action. I came here looking for IPCC publication and error reporting guidelines. – “Our audience are emotional rather than rational” – !! !